Roger McGhee's are pleased to offer this well presented mid terrace house with GARAGE. The accommodation comprises of lounge/diner, kitchen, sitting room, three bedrooms and family bathroom. Also benefitting from double glazing, gas central heating and rear garden. PORCH: Front aspect double glazed door, electric meter, fusebox, wooden inner door with glass panes. INNER HALLWAY: Wall mounted radiator, stairs to first floor, understairs storage space. LOUNGE/DINER: 22' 3" max x 11' 5" max (6.79m x 3.48m) Front aspect double glazed bay window,fireplace, wall mounted radiator, large obscured window, laminate floor. KITCHEN: 10' 11" x 7' 4" (3.35m x 2.25m) Range of base and wall units with worktops over, rear aspect double glazed window, wall mounted radiator, built in double oven, gas hob on worktop, built in sink and drainer, cooker hood, inset lighting, obscure window into sitting room. SITTING ROOM: 13' 5" x 8' 10" (4.1m x 2.7m) Rear apect patio doors UPVC with surrounding windows, wall mounted radiator, UPVC side aspect obscured windows. 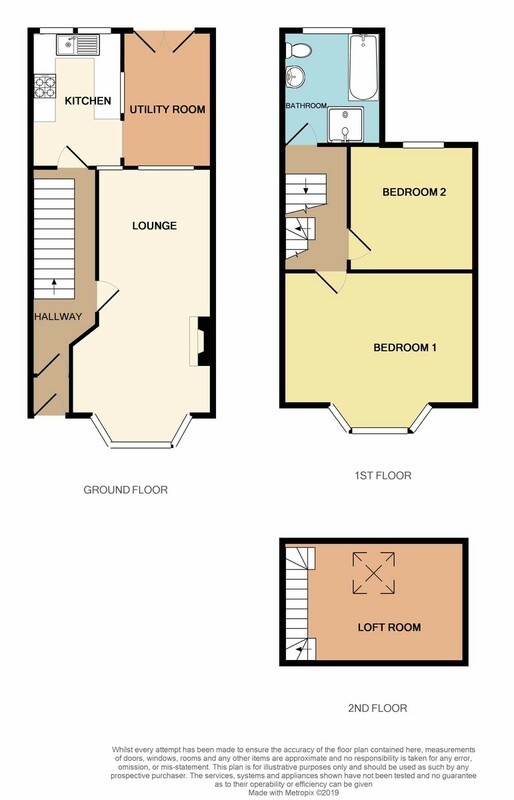 BEDROOM TWO: 10' 5" x 7' 2" (3.2m x 2.2m) Rear aspect double glazed window, laminate floor, built in cupboard storage. BEDROOM THREE: 16' 8" x 9' 4" (5.1m x 2.85m) Stairs to loft room, velux window, radiator, eaves storage. BATHROOM: Laminate floor, pedestal hand wash basin, WC, shower cubicle with tiled surround, inset bath, wall mounted radiator, rear aspect double glazed obscured window, boiler, cream unit storage, inset lighting. GARAGE/WORKSHOP: 26' 2" x 20' 11" (8m x 6.4m) Separate workshop area, large garage.